Physical impairment is the main hallmark of frailty; however, evidence suggests that other dimensions, such as psychological, cognitive and social factors also contribute to this multidimensional condition. Cognition is now considered a relevant domain of frailty. Cognitive and physical frailty interacts with each other: cognitive problems and dementia are more prevalent in physically frail individuals, and those with cognitive impairment are more prone to become frail. Finally, social frailty is significantly associated with disease outcome and mortality risk. In current clinical practice a lot of risk assessment test for early screening and intervention of physical frailty and cognitive decline are already available, including biomarkers (APOE4, inflammatory markers, Vitamin D, etc. ), clinical measures (MMSE, GDS, gait, weight, strength, balance, etc. ), as well as imaging (MRI, CT, etc). Despite a good clinical evidence as “single shot” screening tests, unfortunately, nearly all of the tests are not sensitive for very early and small changes in the risk factors in order to allow for appropriate prevention of associated diseases, like dementia, sarcopenia or falls in later life. Besides this clinical practice, in recent years a lot of technology solutions were introduced to support active ageing and tackle frailty, cognitive decline and social isolation of older adults. Despite that those ICT-based solutions are of a certain value regarding diminishing single risks (e.g. fall risk, etc. ), there is still a need for a more holistic approach which aims to address all of the individual risk factors together. Also it is mandatory and needed not only to identify those risks, but also to provide tailored interventions based on the outcomes of the risk analysis. And exactly this is the main objective of my-AHA project, aiming for an ICT-based solution for early risk detection and intervention (i.e. prevention), in order to support active and healthy ageing and prevent cognitive impairment, frailty, depression and falls by unobtrusive behavioural sensing, based on large scale collection of data, readily available in the daily living environment of older adults (see figure here below). 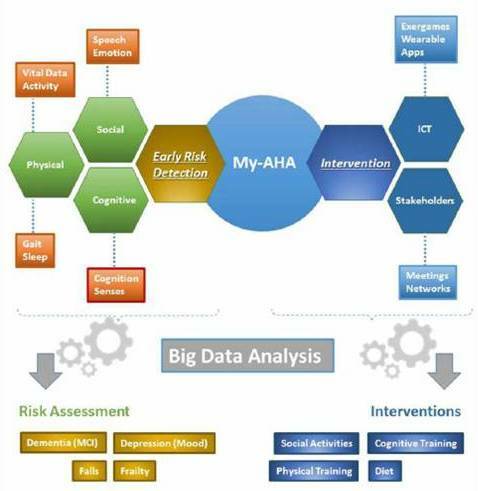 My-AHA solution supports active and healthy ageing by enabling early detection and mini­mization of risks associated with ageing, and in particular for Dementia (MCI), Depres­sion (Mood), Falls and Frailty. In these terms the early risk detection considers three funda­mental aspects of the life of older adults, physical activities (by considering vital data, gait, quality of sleep and in general, movements activities, and fall risk), cognitive activities (by monitor the cognitive level, e.g in exergames) and social activities (e.g. by analyzing the emotions and the quality of speech of the users). On the other hand, MY-AHA designs and implements more efficient and effective ICT-based interventions tailored to the early identified risks, by inte­grating innovative ICT solutions and involving the stakeholders. The suggested social acti­vities, as well as cognitive and physical trai­nings and the diet proposed to the older adults via the new platform will help the users in chan­ging their behaviour sustainably and in reacting to the consequences of ageing.